Manufacturer of a wide range of products which include aluminium foil laminated self adhesive butyl rubber sheet. 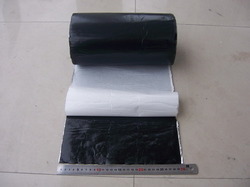 Aluminium Foil Laminated Butyl Rubber Sheet is used to provide joint sealant against air, dust and moisture infiltration. The Aluminium foil is design to use its excellent reflection to sun rays on the top.